The Beverley Mine is Australia's third uranium mine and Australia's first operating in-situ recovery mine. 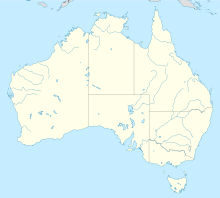 It is located in South Australia in the gazetted locality of Wooltana about 35 km from Lake Frome at the northern end of the Flinders Ranges. It officially opened in 2001. The original Beverley uranium deposit was discovered by one of Bill Siller's companies in 1969 and was named after his wife—Beverley Siller. The mine is owned and operated by Adelaide-based company Heathgate Resources Pty Ltd. Heathgate Resources is a wholly owned subsidiary of General Atomics. Beverley is a paleaochannel uranium deposit. The uranium mineralisation (mainly coffinite) is hosted by loose sands in the channel of a former river. The ore bearing horizon is now at a depth of about 100 to 150m. The deposit is estimated to contain 21,000 tonnes of uranium oxide for a mine life of 15 to 30 years. Uranium is extracted by in-situ leaching, involving the injection of a fluid containing sulphuric acid and hydrogen peroxide into the ore-bearing permeable horizon to mobilise the uranium. The fluid is then recovered and uranium is extracted at a central plant using ion-exchange. The final concentrate is trucked to Port Adelaide and then shipped to international customers. In August 2008, Federal approval was given to Heathgate for a greater area to be accessed for mining in order for the pre-approved volume of material to be extracted from the mine. Between 1998 and 2007, Heathgate reported 57 spill incidents to Primary Industries and Resources South Australia (PIRSA). In 2005, the Four Mile uranium deposit was discovered a few kilometres north-west of Beverley. The deposit is owned by Quasar Resources, (a 100% subsidiary of Heathgate), and Alliance Resources. Development of the deposit was approved in 2009. It is planned to do the final uranium extraction and concentrate production for Four Mile at the Beverley Plant. The mine borders on the protected Arkaroola Wilderness Sanctuary that has previously been subjected to uranium mining. Following unprecedented public pressure, the South Australian government announced on 22 July 2011 that steps would be taken to ban mining and exploration in Arkaroola. In 2009, additional deposits were discovered at Beverley North. Approval was granted to mine at Beverley North in 2011. ^ a b "Search result for "Beverley Uranium Mine (Mine)" (Record no. SA0044737) with the following layers selected - "Suburbs and Localities" and " Place names (gazetteer)"". Property Location Browser. Government of South Australia. Archived from the original on 12 October 2016. Retrieved 5 October 2016. ^ a b "FAQ's:The Mine". Heathgate Resources. Archived from the original on 2009-09-13. Retrieved 2009-07-16. ^ "Affiliated Companies". Retrieved 2016-09-19. ^ "Heathgate Resources". www.heathgate.com.au. Retrieved 2016-09-19. ^ Sabra Lane (2008-08-28). "Garrett approves Beverley uranium mine expansion" (Transcript). PM on ABC Local Radio. Australian Broadcasting Corporation. Retrieved 2009-07-16. ^ "Payout for protesters locked in shipping container". ABC. 2010-04-09. Retrieved 2015-06-06. ^ "ASEN | 'Feral' Beverley uranium mine protesters win Supreme Court lawsuit". asen.org.au. Archived from the original on 2015-07-07. Retrieved 2015-06-06. ^ "Premier Mike Rann announces permanent protection for Arkaroola Wilderness Sanctuary". Herald Sun. 2011-07-22. Retrieved 2011-10-06. ^ Marsland-Smith, Dr A. "Heathgate Resources update" Slideshare.net 2013-11-26.